As the seller of the winning ticket, the family owned Wesley's Restaurant and Lounge in Elkton, MD stands to earn $25,000. But the bigger excitement is the mystery behind the winning ticket holder. "I hope it is someone we know personally so that we can share the health and wealth with him and everything else," said John Wesley. The Powerball draw of Dec. 24 was worth $125 million to the winner, but so far he has not come out publicly to claim the prize. He did call the lounge to confirm the winning numbers but didn't leave any name or contact data. Although the sale was caught by a surveillance camera, the video footage was grainy and not enough to show a recognizable face. But still, the Wesleys have a good idea of who the winner might be. The Florida Lottery's jackpot prize was finally won after three months of waiting. During the interim, it had grown to $50 million, and the winning ticket was bought in Tallahassee. The Powerball also had a winner for the Christmas Draw. The single winning ticket was sold in Maryland and was worth $125 million. The Florida lottery draw had not been won in the past 3 months. The winning jackpot prize was the largest prize won for the year, as well as the largest single prize since April 2010. "I was in shock, I'm still in shock," said Donny Jones after winning the Idaho Powerball. Jones, the head cook at the Hometown Kitchen restaurant in Idaho Falls, ID, won $200,000 from the lottery. He plans to pay most of his bills but has no other immediate plans about the money but to open a savings account with it. Born with a disability, Jones started out as a dishwasher 16 years ago. He says his coworkers are like a family to him, helping him out and looking out for him. "I love my job and I love my bosses and everybody I work with here," he said. His employment training specialist, Linda Asher, thought that it was a blessing that he won. David Lee Franey, a lottery retailer who owns for Franey's Food Mart in Owensboro, Kentucky, won $200,000 from a winning lottery ticket which he didn't know he had. The ticket was a duplicate and the result of a misprint from a lottery player who wanted to play the same numbers on an old ticket. The winning ticket was a duplicate from a misprint when a lottery player requested to play the same numbers on her losing ticket. The terminal has a feature where you enter the ticket, and the same numbers are printed on a new ticket. Seeing that it was taking too long, the store clerk manning the lottery terminal scanned the ticket twice resulting in two tickets being printed. Instead of filing the paperwork for the misprint, Franey had standing instructions to tape the duplicate ticket on the side of the lottery terminal. The Kentucky Lottery noticed that the two winning tickets were bought at the same store initiated a procedural investigation to find out the circumstances of such a large win. The store clerk didn't know that there was a winning ticket, and only pointed out the ticket taped to the lottery terminal. The other winning ticket has not been claimed. The Kentucky Lottery has no regulations against a lottery retailer from buying or winning lottery tickets. If you missed the December El Gordo draw, you still have another chance to win big at the start of 2012. The special El Nino draw is a great opportunity to have a prosperous new year as over €840,000,000 (1,092,376,074.91 US dollars) worth of prizes will be up for grabs. The odds of winning a prize in this draw is 1-in-3 and there will be 37,812 new winners. The first prize alone is a massive €120,000,000 or USD 156 million – definitely a great way to start the new year. The Special El Niño draw will be held on Saturday, January 6, 2012. The complete prize breakdown is provided below. So if you want to reserve your tickes now, go to: http://el-gordo.com. Robert Norton couldn't believe that he won $250,000. He scratched his Sparkling Gems instant lottery game ticket and it showed he won. "I had to have someone else look at the ticket and confirm what I was seeing," Norton said. Norton purchased the winning ticket at the Meijer 175 gas station, 824 South U.S. Highway 131, Three Rivers. He said that he had been playing the lottery for 36 years and had won only $720. “This is much better,” he said. “It will definitely take some of the stress off.” He plans to pay off debts. Retired truck driver, Tim Lawton took a hunch and picked the winning Hoosier Lottery instant game ticket. "It was a fluke that I picked that one," Lawton said. "It was like a light went on and something told me to buy it." Lawton is the first winner of "Indiana's $5 Million Club" scratch-off game. He chose the cash option and collecte $2.8 million after taxes, according to the Hoosire Lottery. He bought the ticket at Stateline Tobacco Discount, 6843 North Old 27. He says he will be helping his children and grandchildren with the prize money. lottery players in Redbridge to check their tickets for the unique EuroMillions raffle selection number, as they might have become an instant millionaire. Each week there are two raffles, and the November 23 winner has not yet come forward to claim their prize. The winning selection for the Nov. 23 draw was VVS586769, and so far no word has been heard about the winner. The lucky ticket-holder has until May 23, 2012 to claim the prize, otherwise it goes to charity. Sales of Kentucky Lottery tickets increased by year on year. Compared to the same period last year, the lottery had a 2 percent increase in sales for the period of July to October 2010. During the board meeting in Louisville on Thursday, lottery directors were also given a briefing on the Powerball changes starting in January. The prize of the Powerball ticket will double to $2, at the same time the starting jackpot will also double to $40 million. The second prize will also increase to $1 million. Overall the chances of winning will also increase. A San Jose woman made a quick trip to a convenience store to buy eggs, and bought a winning instant lottery ticket as well. Pamela K. (California Lottery officials did not divulge her full name on the request of the winner) bought the eggs and the winning Cash Spectacular Scratchers ticket at the 7-Eleven at 1595 Branham Lane. Pamela was at the counter to pay for the eggs, when she noticed that there was only one remaining Scratchers ticket, and bought it. She said that she thought "That must be the lucky one." She will use part of her winnings to pay off her house and she might also buy a car. She was also thinking of retiring from her job at an eyeglasses firm, where she's been working for the past 23 years. Twelve employees of the Waypoint Centre for Mental Health Care in Penetanguishene won the November 25 Lotto Max jackpot. They have been playing the lottery as a group for a little more than a year, each putting in $10 per week to the pot. Each member of the syndicate will receive $1.75 million as their share of the prize. The ticket was bought at Mac's convenience store in Main Street in Penetanguishene. “We're over the moon,” said Laurie Soper, one of 12 lucky winners. "It's going to be a very merry Christmas." With the lottery win, two of the winners will be retiring, while others are planning of travelling. The Hoosier Lottery revealed that a $1 million lottery ticket was bought in Warsaw, Indiana. Lottery authorities were asking citizens and lottery players to check their tickets for the winning number. 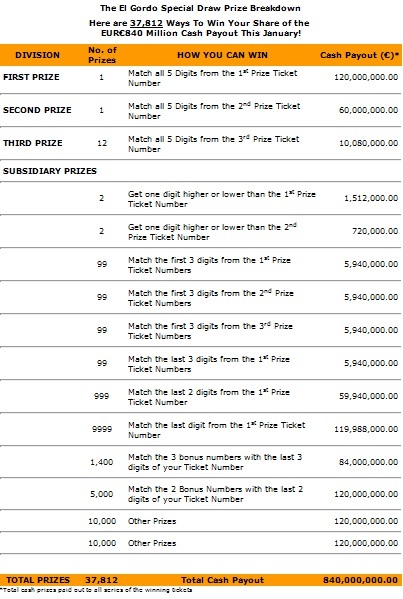 No ticket matched all six numbers in the draw, however, one ticket bought in Warsaw matched five numbers for a second-tier prize of $250,000. The ticket buyer had also added the Megaplier for an extra dollar. The Megaplier number drawn was 4, and the resulting lower tier cash prize was multiplied by 4 to $1 million. The ticket was bought at the 66 Center at 2518 E Center Street in Warsaw. The Mega Millions lottery top prize rolls over to an expected $100 million on the next draw Friday. Marilyn Garcia-John, 50, won $1 million from a Black Pearls instant game and became the third New York Lottery millionaire for the year. She bought her ticket over the summer from the Port Chester Mini Mart on Westchester Avenue. She had forgotten about it, even as it was in her purse, until her son asked her to play it. Originally from the Dominican Republic, Garcia-John has three sons and works as a bank teller. The prize is paid in annual installments over a period of 20 years. Garcia-John will be receiving a yearly check of $33,015 after taxes, up to 2030. Bobby Caldwell of Barnesville, Georgia won $4 million from playing the Super Millions scratch off lottery game. Caldwell is retired and plans to buy a new home with his prize. The Super Millions is an instant lottery game with prizes up to $5 million. Losing tickets can be entered into a draw with a chance at winning $1 million. Since its inception, the Georgia Lottery Corp. has raised close to $13 billion for educational programs, including Georgia's HOPE Scholarship Program and Georgia's Pre-K Program. As promised, the three Powerball winners from Connecticut donated money to charity. The winners put up a trust fund called the Putnam Avenue Family Trust and through this donated $1 million to five charities which help veterans. The winners work as fund managers and the trust aims to become "a national model for others who have been equally fortunate in winning sweepstakes and now seek to use those dollars to touch the lives of others." The Bob Woodruff Foundation, Building Homes for Heroes, Services for the Under Served (S.U.S. ), Operation First Response and the Intrepid Fallen Heroes Fund each received $200,000. These organizations were chosen by the trust on the basis of their ongoing work and their track record working with veterans. UK Millionaire Raffle: 25 New Millionaires on December 23rd! From November 25th to December 23rd, Grab the chance to become one of the 50 lucky winners of the UK Millionaire Raffle! In the next 30 days, 50 fortunate individuals will be made millionaires thanks to EuroMillons' UK Millionaire Raffle! The much-awaited celebration of the Millionaires Month will officially start on the 25th of November. On this occasion, 18 winners of GBP1,000,000 each will be drawn, instead of just one! The next four draws on the Fridays following November 25th will result in one raffle winner per day. However, the most exciting event will be held nearly a month later, on December 23, where 25 individuals will become instant millionaires! By the end of the month-long celebration, 50 instant winners of GBP1,000,000 each would have been named! But the competition does not simply end there; the same 50 winners will become eligible to win the Euro Millions Jackpot prize! A separate raffle, the add-on Millionaire Raffle, is also every week prior to the main raffle draw, which is the Euro Millions raffle. There is a new winner drawn every week for the add-on Millionaire raffle who is guaranteed to win a total of GBP1 Million , as well. Unfortunately, only tickets that are purchased in the UK count as valid entries to the Euro Millions Raffle draw. These entries may be a bit more expensive compared to those sold in other countries or regions, but it is worth the price because each ticket ensures an extra raffle number matched specifically to that particular entry only. One of EuroMillons' most anticipated and sought-after raffle draws is the UK Millionaire raffle. The UK Millionaire Raffle guarantees several winners of a million pounds for each of its draw, which are conducted on a weekly basis. Hopefuls may even place their bets early in order to get a better chance at winning. Winners of the UK Millionaire Raffle are drawn every Tuesday and Friday. When you purchase a EuroMillions Raffle ticket, your advanced bets are automatically placed so that if you are not chosen for the other contests, you will automatically become eligible to enter and take part in the UK Millionaire Raffle, exclusive only to those who reside in the UK. This promo was based on the premise that a lot of the residents of the UK are looking forward to higher chances of winning, as well as a higher amount that could be won. As with any raffle draw, sevreal experts and officials have come up with the necessary data to predict the probability of winning the UK Millionaires draw. It was revealed that on the draws done every Tuesday, a participant has a one in approcimately 3.5 million chance of winning the raffle. As for the Friday raffle draw, the sales skyrocket, so the ratios rise in proportion to it, leaving participants with a one in 9.2 million chance of winning the raffle draw. The raffle draw is televised exclusively on a portion of the Friday night BBC show in the UK and as a segment on the exsisting EuroMillions draw. You may also access the draw on 10:30 in the evening every Tuesday via a link on the EuroMillions' website. The raffle draw itself is conducted with the use of an Automated Draw Machine (or simply called an ADM) in order to ensure that all of the winning entries that are drawn are valid. This special machine has been used in the UK in previous years, even on the premium ERNIE bonds. , What occurs in these systems is that all of the raffle entries will be gathered and placed into the hat. Then, tickets will be drawn at random and winners will be declared. These special systems have been used in conjunction with the Camelot system. With the aid of the Camelot system every single one of the raffle entries are assigned unique numbers to coordinate the one bought by the ticket's owner. . In this manner, all of the raffle entries stand a fair and equal chance of winning the raffle draws. Contestants of the raffle draw may also rest assured that these systems are functionuing well and not prone to any malfunctions. These Automated Draw Machines have all undergone proper testing before being put to use. These systems have also received due verification from the National Lottery, as well as the University of Hertfordshire's Department of Statistical Analysis. The first draw would be the El Gordo Draw, happening this December 22nd. Since the draw is traditionally played during the Christmas season, it has also become known as the “Navidad” draw. Despite its expensive ticket prices, the El Gordo Draw is the world’s largest and longest running lottery. Just in the previous year, the winnings from this draw amounted to $3,000,000,000! Best of all, the winner of the draw may claim his prize all in one go, instead of it being spread over several years, and may even have it tax-free! This makes the El Gordo lottery draw very popular with the Spanish, 98% of whom are estimated to be participating this year! Despite the popularity of the draw, the odds of winning a prize in the El Gordo draw is actually quite high. Over 100,000 tickets are produced for the draw, while over 37,000 cash prizes will be given out in every draw, giving you almost one in three chances of winning! Tickets are sold in local shops and bars throughout Spain, but may be purchased by non-residents through internet providers, such as Platinum Placements International. However, there is also another option for those who would like to participate in the El Gordo draw, but cannot afford to purchase a ticket. The El Gordo Group draw allows participants to pool their betting money as a group, giving you more tickets and more chances of winning! This is the more practical and economical option. This option is also open to international player through Platinum Placements International for only $23 per share. The next major lottery draw, Japan’s “Year End” Jumbo Draw, is done only 4 times a year; the biggest draw being the one held at the end of the month, to celebrate the coming year. On a global scale, it is second only to the El Gordo draw in terms of cash prizes. However, it is the biggest in Asia; paying out over $2,000,000,000, tax-free! The draw this month will result in 132 winners of about 200,000,000 Yen each! There will also be second, third and fourth prize winners who will receive large sums of money, as well. However, tickets to this draw are not very accessible and are sold in Japan exclusively by the Mizuho bank. The demand for these tickets are extremely high and tickets are usually sold out just days before the draw itself. Entries from non-residents of Japan will find it even more difficult to enter this draw, making it necessary to place their bets way before the set deadline. Interested individuals must get in touch with Platinum Placements International as soon as possible. Lastly, there’s the Australian Superdraw. Held 7 to 8 times a year in Australia, this draw offers cash prizes that are much larger than the usual weekly draws. The jackpot prize for the Australian Superdraw is funded by the earnings from weekly Australian draws, such as the Powerball, Saturday Lotto, and the Oz Lotto. This puts the jackpot prize at about 20-30 Million Australian dollars. This draw uses the 6/45 matrix, wherein players are made to choose a combination of any six numbers between 1 to 45. The players whose numbers match the winning combination will be named the winner! However, there will be 2 extra numbers that will be drawn, in order to increase the players’ chances of winning. The Australian Superdraw is extremely popular because while it offers the largest cash prize in the Asia-Pacific region, it is still very accessible. Its tickets don’t cost any more than that of the weekly draws. The chances of winning are the same as that of the weekly draws, too. The last and largest Superdraw will be held on the very last day of the month, December 31st, in order to ring in the new year. The jackpot of this draw will pay out at least 31,000,000Australian dollars, along with hundreds of consolation cash prizes. Residents are already lining up to get their tickets and place their bets, so interested players who live abroad will have to get in touch with organizations, such as Platinum Placements International, to secure a ticket for this draw. According to Terry Rich, the Chief Operating Officer of the Iowa Lottery, the one-month countdown has begun for last year's Dec. 29 Hot Lotto draw winner. If the jackpot prize is not collected by 4:00 pm on December 29, the prize money will be forfeited in favor of the 15 lotteries offering Hot Lotto. At stake is the estimated lump sum greater than ten million dollars after taxes. The draw was held December 29 of last year, and the lottery rules state that the winner has one year to collect the prize. Since then, the Iowa Lottery has been going to the media in searching for the million dollar winner.